Torica Whitty: One of the top Pro Staff for KNB. 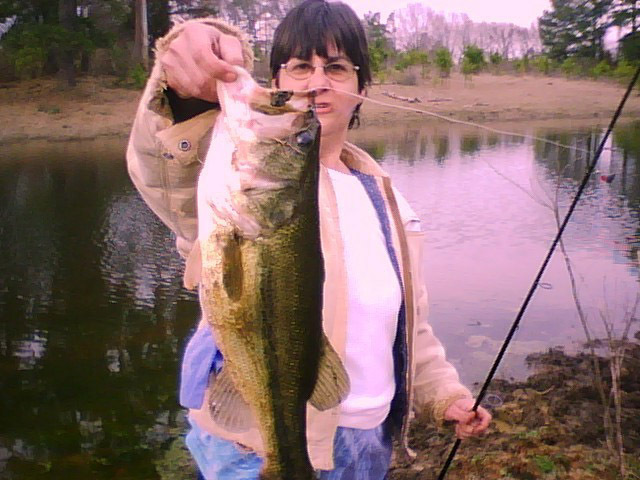 Carol Smith my sister with just one of her big bass from Texas. 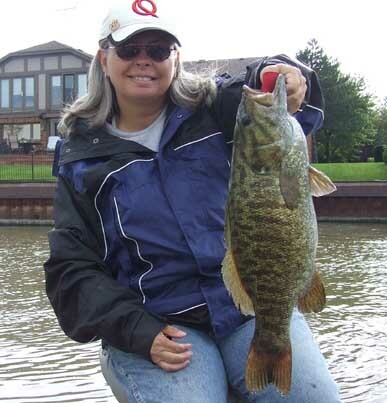 Sherry-Lynne Beam A Kick'n Bass® Pro-Staff from the great brother state of Canada with big brownie. Bobbie Gayle Kick'n Bass® Pro Staff. Using KNB and live bait to catch these monsters! Bobbie Gayle Kick'n Bass® Pro Staff. Women of the year, unbelievable fish over 10 pounds! Dianna Mason with what she calls "another keeper". Five like this and Dianna will laugh all the way to the bank. A Kick'n Bass® Pro-Staff, member WBFA. 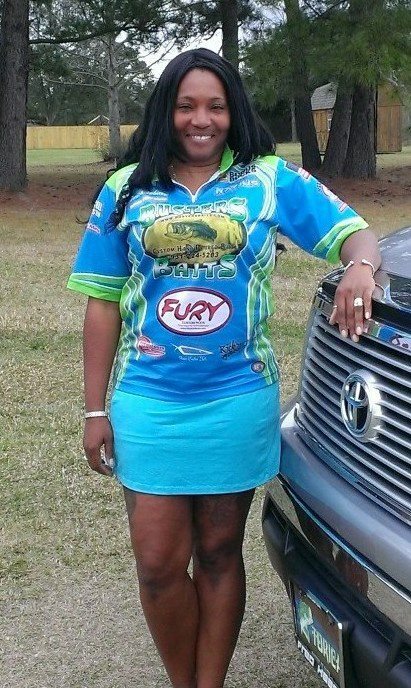 Bonita Staples A Kick'n Bass® Pro-Staff from the great state of Texas. Bonita writes, fishes, runs tournaments and has been with KNB from the start. Check out her page. Bonita Staples Texoma Striper tournament and a great placing in a hard tournament. Lori Masters. One of her better bass on KNB. 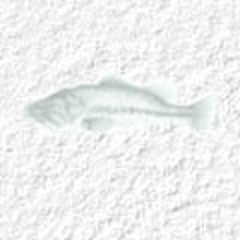 Some catches using Kick'n Bass®. Bill Warman does it again with another 11 plus fish from Canyon Lake, AZ. Bill Warman and Hybrid Striper's and awards. Bill Warman at Cabela's® Walleye Tournament in NE. Willis Beam Canadian Kick'n Bass® Pro Staff with some nice Walleyes, Bass, Stripers and Smallies. Tim Price Canadian Kick'n Bass® Pro Staff with some huge Walleye and Muskie's. Ken Revell and Kick'n Bass® Pro-Staffs too many to name! Chuck Bauer Kick'n Bass® Pro-Staff with a "World Record Channel Catfish" the first page done a long time ago. Chuck Bauer Kick'n Bass® Pro-Staff with a "World Record Channel Catfish" the whole story and more pics. A must read ! Chuck Bauer Kick'n Bass® Pro-Staff with a fat 11 pound plus CA bass. Chuck Bauer Kick'n Bass® Pro-Staff with his collection of Salt Water fish! Chuck Bauer Kick'n Bass® Pro-Staff with a 9.9 and 6.6 caught on Kick'n Bass® garlic. Chuck Bauer Kick'n Bass® Pro-Staff with a 9.5 and 9.7 personal best! caught on Kick'n Bass® garlic. caught on Kick'n Bass® garlic. Chuck Bauer Kick'n Bass® Pro-Staff with a 7# 10 oz out of a private lake in Phoenix. caught on Kick'n Bass® garlic. Mexico Bass, Greg and Cos 11-12-01 Lake Huites. The Kick'n Bass® fish factory. Butch Gayle Kick'n Bass® Pro-Staff with a mess of 10 pound plus hogs! Bob Bernardo Kick'n Bass® Pro-Staff our CA representative with a nice smallmouth from KY.
Stinky and three big salmon. Danny and Stinky with two nice yellowtail. Cosmic and real reason to use the Lip Grip'r, and AZ Dink ! Cosmic and a 8 pound 11 ounce in HEAVY BRUSH ! Cosmic and a 9 pound 1 ounce in 25 foot tree-tops. Cosmic and a hard day at the office. Floyd Yarbrough Editor of Outdoor Times Magazine of Texas with a nice Lake Huites Mexico Bass. Chance Mitchell KNB Pro with 7# Lake Grandbury TX Bass and on Hog Tank with Testimony. Tom Eubanks of AZ our Kick'n Bass® Pro-Staff with a 9 # from Lake Un-Pleasant. Daniel White of Glendale AZ with a 13.69# spawned out Lake Pleasant sow. Kick'n Bass® Pro-Staff. George Welcome and Scott Welcome of Imagination Bassin Guide Service with a huge Florida Bass. Kick'n Bass® Pro-Staffs. Scott and George Kick'n Bass® Pro-Staff with more big bass from their Florida Guide Service. Keith Nightswonger Kick'n Bass® Pro-Staff with a great web site. Dave Taylor of Texas one of our Kick'n Bass® Pro-Staffs with some nice pics. Charlie Credicott Kick'n Bass® Pro-Staff of Ft Worth Texas, 100 Team Tournaments. Charlie Credicott Kick'n Bass® Pro-Staff and a good friend of Ken Revell and KNB. Jimmy Jones of the Dallas Cowboys now of the Kick'n Bass® Pro-Staff. Larry Barnes, Kick'n Bass® Pro-Staff and guide on Lake Fork and Lake Cooper. With the second largest bass ever caught on Lake Fork Texas since Valentine's Day, 1988, you have to see this Bass. Gary McAdams Kick'n Bass® Pro-Staff with his first place bass. Angel Valdez our California Kick'n Bass® Pro-Staff with a great CA hog and a 24 # Striper. $21.000 First Place win for Kick'n Bass® team of Mitchell and Nichols in Texas. Wes Winget Kick'n Bass® Pro-Staff and guide on Lake Ray Roberts. Nice Hog! Wes Winget with a fat 2001, 11 pound Texas Winter Bass! Jeff Bradshaw California Kick' Bass® Pro-Staff'r with a real nice fish. Bud Fields Kick'n Bass® Pro-Staff with some nice hogs. Bud Fields Kick'n Bass® Pro-Staff with a cloudy day catch. Al White Kick'n Bass® Pro-Staff and great big hog. Eddie Roberts Kick'n Bass® Pro-Staff with a nice bass. Eddie Roberts Kick'n Bass® Pro-Staff with a huge Louisiana hog. T. Chad Kick'n Bass® Pro-Staff with his award which place him number one in the tournament standings in the Redman Northeast division...Regional, July 2000. Kenny Marshall Kick'n Bass® Pro-Staff with a good fish from a tough days fishing. Kenny Marshall Kick'n Bass® Pro-Staff with a nice fish from Purdis Creek. Jim Noah Kick'n Bass® Pro-Staff with two good hogs. Mike Whitten Kick'n Bass® Pro-Staff from TN with tons of big smallmouths! Steve Hacker Kick'n Bass® Pro-Staff with some really big Smallmouths! Steve Hacker Kick'n Bass® Pro-Staff guiding Kevin Moore to some big smallies. Steve Hacker Kick'n Bass® Pro-Staff with more clients and big smallmouths. Mike Skyba Kick'n Bass® Pro-Staff with a nice smallmouth from Canada. Mark Millward Kick'n Bass® Pro-Staff with a fat Texas hog and two nice stripers. Ronnie Poe Kick'n Bass® Pro-Staff with a big 9 pound hog. Ronnie Poe Kick'n Bass® Pro-Staff with a 6 1/2 from Grandbury. Dave Mills Kick'n Bass® Pro-Staff with a nice Ray Robert's bass. Luke Scholl Kick'n Bass® Pro-Staff on Ray Robert's with a HOG! John Irwin Kick'n Bass® Pro-Staff of Texas with a nice bass. Bruce A. Leingang Kick'n Bass® Pro-Staff with two fish from a NATA Tournament. James Barlow Kick'n Bass® Pro-Staff from LA. Mike Rose Kick'n Bass® Pro-Staff with his Second Place winning fish. Jerry Drazer Kick'n Bass® Pro-Staff from Indiana with two winning fish. Ken Nance Kick'n Bass® Pro-Staff with two good fish and some great Testimony on our stuff. Daryl Whisenant Kick'n Bass® Pro-Staff and a nice 5# plus bass. Daryl Whisenant Kick'n Bass® Pro-Staff and wife with a Lake Norman Win! Trent Dagley Kick'n Bass® Pro-Staff and a cold Utah big bass. Trent Dagley Kick'n Bass® Pro-Staff with a nice smallmouth and a Tiger Muskie, Trent fishes WON and uses KNB. Greg Ingram Kick'n Bass® Pro-Staff and a First Place finish. Greg Ingram Kick'n Bass® Pro-Staff and a fish he really needed. Greg Ingram Kick'n Bass® Pro-Staff and another check for 2002! Rich Stringer Kick'n Bass® Pro-Staff with his new "Finger Rest" and some rare Arizona clouds. Rich Stringer Kick'n Bass® Pro-Staff in Dallas TX at Bass Pro Shop. Rich Stringer Kick'n Bass® Pro-Staff in Dallas TX at Bass Pro Shop 2002. Mike Howell Kick'n Bass® Pro-Staff with a big 10 pound plus from Lake Fork. Tom Coss Kick'n Bass® Pro-Staff with a 6# 13 oz beauty out of Clear Lake Ca. Mark McManaway. Kick'n Bass® Pro-Staff with his personal best 11.3 lbs. Jeff Cheatham Kick'n Bass® Pro-Staff with a Big Flathead caught on KNB! Jeff Cheatham Kick'n Bass® Pro-Staff with a money winning stinger! Jeff Cheatham Kick'n Bass® Pro-Staff with another first place win! Rob Shaw. LT Rob Shaw, Executive Officer, USS ARDENT (MCM 12) Kick'n Bass in the bad guys back yard. Marc Adamsen Kick'n Bass® Pro-Staff (Gunny) from the IBBT 2002 tournament. J.W. Peterson Kick'n Bass® Pro-Staff, Lake Fork "J&J Guide Service" with one fat one over 11 pounds. Charles Sim Kick'n Bass® Pro-Staff, of the great east coast with a big Walleye. Jason Brown Kick'n Bass® Pro-Staff with two Tournament winning bass. Bruce Leingang with a 1st place finish at America Bass Angler's Tournament at Choke Canyon, Nov 2, 2002. Jason Hoffman Kick'n Bass® Pro-Staff Customer Steve Mayo and I caught these 2 giants just a couple of minutes apart. Tom Lusk: Canadian Kick'n Bass® Pro-Staff with some nice northern bass. Dave Stuppuhn of Iowa with bass, walleye and pike.